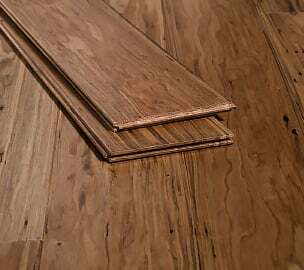 Welcome to our strand woven eucalyptus flooring information page. Strand woven eucalyptus floors are up to 3 times harder than traditional hardwood floors, and much more affordable. The knots of the eucalyptus tree still give these floors a beautiful and sophisticated look, but with a tough-as-nails finish and construction. Our eucalyptus wood floors are harvested from well-managed forests every 3-5 years, and as a rapidly renewable material, they're good for the environment too. Check Out All Of Our Floors Now! Traditional eucalyptus hardwood floors are beautiful in their own right, but not as hard or affordable as the type that we sell. Our strand woven solid eucalyptus floors are composed of strands of eucalyptus that are pressed together under very high pressure and heat - causing the wood fibers to fuse into a gorgeous plank that's many times harder than regular eucalyptus and has a much more interesting grain. They come in either tongue and groove or click lock versions and are suitable for installation on above as well as below grade. Due to its incredible hardness, stranded eucalyptus wood flooring is ideal for families with active lifestyles and pets or children. The patterns and marbling formed by the compression process create beautiful and distinct patterns on the floor. 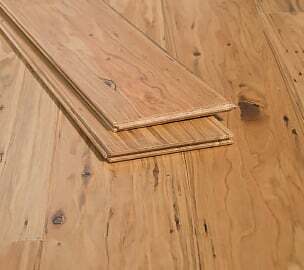 Much like bamboo floors, eucalyptus strand woven floors are many times harder than traditional hardwood flooring. The main difference between the bamboo and eucalyptus floors is aesthetic - in eucalyptus you see the knots of the eucalyptus tree (small round marks), whereas in bamboo you see the nodes of the bamboo culms. Other than that, there's really no difference between bamboo and eucalyptus wood flooring. Eucalyptus and bamboo are both installed and maintained the same as traditional hardwood floors, and they are very easy to maintain and clean. 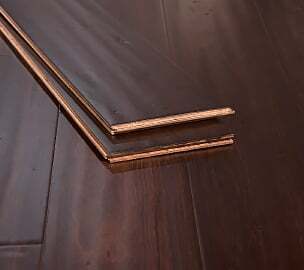 Strand eucalyptus floors are typically half the cost of the higher priced traditional wood flooring. We sell our floors at around $4-$5 per square foot in premium (wide) planks, which is very economical when compared to wide plank wood floors that cost $7 per square foot and up. The proprietary AccuSeal Ultra® Finish System that we use on our floors is a long-lasting finish system that uses fewer coatings to allow for more grain clarity, while also providing industry-leading abrasion resistance, allowing the beauty of the floor to be easily seen. Your guests will be astonished to find out you received such a high-quality finish at such an affordable price. Strand Woven Eucalyptus flooring looks like a fine tropical mahogany, but it's more than twice as hard as red oak and it boasts all the eco-friendly benefits of a quickly renewable hardwood. When you choose eucalyptus, you’re not only making a great choice for your home, but you’re also making a great choice for the environment. The eucalyptus can re-grow in as little as 3-4 years at which time it is harvested for optimum hardness and maturity. This allows us to control the dimensional stability so that the floors don't experience problems during seasonal cycles. Eucalyptus is known for its toughness and ability to resist dents, making eucalyptus hardwood floors an excellent choice – thanks to its durability, you can rest assured knowing your floor will hold up through the years no matter what life throws your way. At Ambient® we harvest all of our eucalyptus from well-managed forests in Southern China. China holds the world's second-largest planting of eucalyptus (after Brazil), as a result of widespread planting in the 1960's. China is notable for its vast land and varied geographical climates that provide optimal growing conditions for eucalyptus and bamboo. Eucalyptus strand woven floors are great for use in kitchens and other high traffic areas, and have also been used in restaurants and spas. Maybe you’re renovating your home, and you want a floor that not only looks great, but is also dependable, affordable eco-friendly and durable. Or maybe you work in a trade involving floors and you want a top notch, high quality product for your clients. Whatever the case, Ambient has long-lasting eucalyptus strand woven flooring for you! We are proud of our well-merited A+ Certification by the Better Business Bureau, and we’ll stand by you throughout the simple installation process. 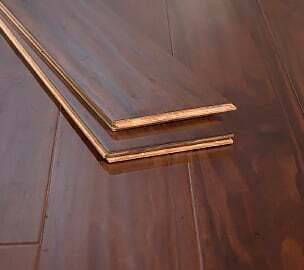 You can even request free eucalyptus flooring samples right on this site. Yes, that’s right – we’ll send the samples at absolutely no cost to you.